How are heroes to be welcomed when the dust of recognition has settled? There is nothing special in his boyish appearance to indicate that we are looking at a hero, diplomat, business executive or (as of Monday, May 14, 1998) the Chancellor of my Alma Mater ... Victoria University at the UofT. Ken Taylor of 5T7 at Vic (UofT) was right "next door" in the Burwash residences on campus at South House (where future actor Donald Sutherland also stayed). What would we recall today about those days? Probably little more than water fights, a demonstration or two, smoke bombs and High Jinx. The residences had a far better atmosphere than all of the fraternity houses put together. We even had time to study. 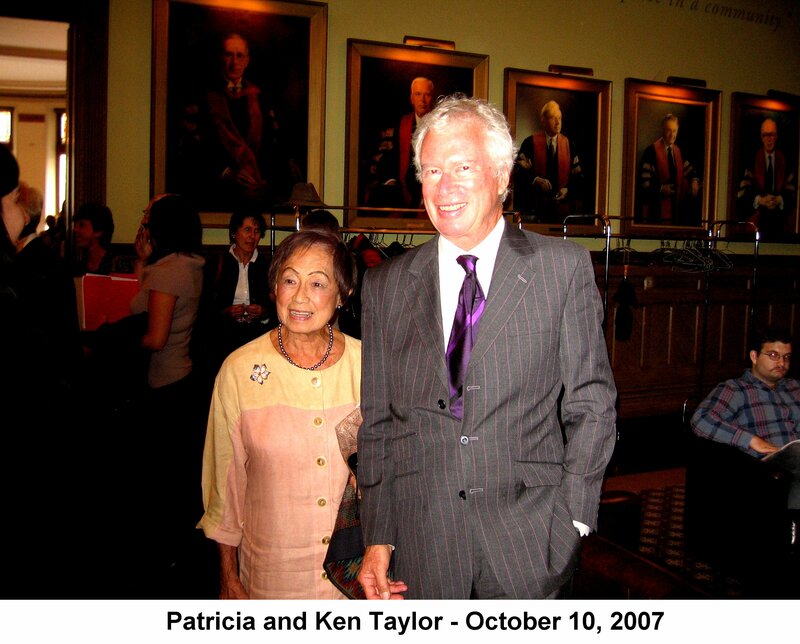 In January of 1979, as the Shah's régime was collapsing, and Iran appeared headed for chaos, Ken Taylor became responsible for having 850 Canadians evacuated. They were scattered all over Iran, but were safely sent home just before the monarch fled. I have no doubt that I'll be introduced to Ken one of these days. I wonder if mouths will drop open at that moment ... as happened when I was introduced to a former Chancellor. I'd guess that all depends upon how the introduction is made. * Forget the British/Canadian spelling of "Honour". Even though the US newspapers and magazine articles reported that Ken Taylor received the Congressional Medal of Honor ... no such thing exists. It's just the Medal of Honor. The most disputed aspect of the movie's version of events has to do with Canada's role in the escape. 30 years ago, Canada received complete credit for the rescue, because the U.S. was worried about possible repercussions if CIA involvement was publicized. (They may also have wanted to maintain the plausibility of a similar ruse in future.) Argo corrects that version of events -- or, rather, overcorrects it, downplaying the actual extent of Canadian involvement, which was considerable. The Americans were housed by two Canadians: the Ambassador Ken Taylor, and a Canadian embassy employee, John Sheardown. (In the film, all of them stay with Taylor; Sheardown does not appear at all.) It was Taylor who cabled Washington to begin the escape plan in earnest, and once the plan was decided on, Canadians "scouted the airport, sent people in and out of Iran to establish random patterns and get copies of entry and exit visas, bought three sets of airline tickets," and "even coached the six in sounding Canadian." Almost none of that appears in Argo. Taylor himself has a major part, and is presented as a sympathetic and brave man who took great personal risks to save the Americans. But his actual role was even larger. He was "spying for the U.S. throughout the hostage crisis, at the request of Jimmy Carter." After some friends who attended the Argo premiere in Toronto described it to Taylor, he expressed concern "that we're portrayed as innkeepers who are waiting to be saved by the CIA," which is a pretty fair description of what the film depicts. Affleck made a small change in response to this criticism: A postscript that contrasted Taylor's 112 citations with the absence of credit given the CIA was rewritten to praise the Argo mission as a model of international cooperation. It's not Canada's involvement that has gotten the goat of some critics, though -- it's the pulse-pounding trip to the airport that serves as the movie's climax. Affleck's version involves every conceivable complication -- each one of them, as it happens, invented purely to make the movie more exciting. (And it works! The finale is thrilling.) In the movie, the U.S. government reverses its approval of the plan at the last minute, meaning there may be no tickets waiting for the Americans when they arrive at the airport. In fact, the plane tickets were purchased ahead of time by the Canadians. Airport security guards stop the Americans in the film, leading to a tense and terrific scene in which one of the Americans makes the risky decision to speak Farsi with the guards, a daring move that pays off hugely. Actually, though, the trip through the airport was "smooth as silk," as Mendez himself has written. Most improbably, the teams of carpet weavers that the Iranian government put to work repairing shredded documents (something they actually did!) piece together the face of one of the six Americans right as the group reaches the airport, and those carpet weavers relay the image to their higher-ups in time for armed men to chase down the departing airplane in a jeep and police cars. None of that happened. Ken Taylor died today, Thursday, October 15, 2015, at about 2:45 p.m. in New York Presbyterian Hospital after a battle with cancer. His wife Pat was by his side. Rest in peace.